The bottom level of the building is the restaurant, The Rainbow Bar and Grill. Upstairs is an exclusive club called "Over the Rainbow", which consists of a full bar, a dance floor, and a DJ booth. The restaurant is next to The Roxy Theatre and The Key Club. The restaurant was founded in early 1972 by Elmer Valentine, Lou Adler, Mario Maglieri and others, opening on April 16, 1972, with a party for Elton John. At the time, the word "rainbow" signified peace and freedom. It quickly became known as a hangout for celebrities of all types. John Belushi ate his last meal (lentil soup) at table No. 16. For many years, the owner was Mario Maglieri. Before becoming the Rainbow, the restaurant was the Villa Nova restaurant, which was originally owned by film director Vincente Minnelli, at the time married to Judy Garland. Joe DiMaggio and Marilyn Monroe met at the restaurant on a blind date in 1952. The Rainbow became known as a hangout for rock musicians and their groupies. Notable regulars at the Rainbow in this period include Keith Moon, Alice Cooper, Micky Dolenz, Harry Nilsson, John Lennon, Ringo Starr, and Neil Diamond. Elvis Presley was known to have occasionally visited the Rainbow. The group of musicians calling themselves the Hollywood Vampires made the Rainbow their home away from home in the mid-1970s. In the last two decades of his life, MotÃ¶rhead frontman Lemmy was a daily fixture at the Rainbow whenever the band was not on tour, and often played a video poker machine at the end of the bar table. Producer Kim Fowley used to hang out at the Rainbow, especially in 1975, when he formed the all-girl group The Runaways. Actress and musician Cheryl Smith was given her pseudonym Rainbeaux Smith early in her career as a result of her frequenting the Rainbow; she briefly replaced Sandy West as drummer of The Runaways at the end of that band's existence. As musical trends on the Strip changed towards heavy metal in the 1980s, the Rainbow followed suit. Members of MÃ¶tley CrÃ¼e, Poison, and Guns N' Roses frequented the bar. It was mentioned in a number of songs, such as "Sunset and Babylon" by W.A.S.P., "Vampire" by L.A. Guns and "Peach Kelli Pop" by Redd Kross, and featured in the videos of "November Rain", "Estranged" and "Don't Cry" by Guns N' Roses and also, although briefly, "Rock Out" by MotÃ¶rhead. Anthony Kiedis of the Red Hot Chili Peppers noted in his book Scar Tissue that he often sat with his father, Blackie Dammett, at the club along with various members of bands such as Led Zeppelin. Often the waitresses and bartenders were groupies as well as those who frequented the establishment. In Pamela Des Barres' book Let's Spend the Night Together, the author commented that as a barfly in the early 1980s she met a number of celebrities including Billy Idol. In June of 2016, the Rainbow started having live music every Wednesday night from 10pm until closing. Various musicians would host the live jam every week. Local acts, as well as different well known musicians would show up to perform random classic rock cover songs every week. During this time, there were many jam band gatherings being established on Sunset Boulevard around the area. 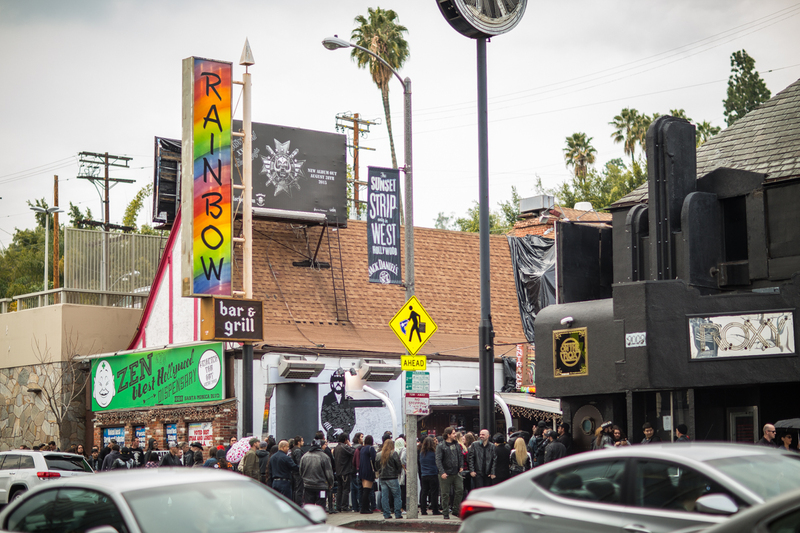 Viper Room and The Whisky a Go Go also joined the Rainbow by allowing musicians to host jams on various week nights as well. On January 18, 2017 the Rainbow was inducted into the Hall of Heavy Metal History for introducing the world to new Heavy Metal acts. The Rainbow is featured in the 2017 fantasy novel The Road To Roo Inn by Morat.